Olivia Dwyer has chiller alternatives to the six Great Walks on the island. New Zealand has nine designated Great Walks — networks of trails and backcountry huts — six of which are on the South Island. While these tracks live up to the title, lesser-known walks on the island are just as pretty, cost less, and see smaller crowds. 1. In the northern part of the South Island, the Abel Tasman Coast Track is famous for golden-sand beaches and is mobbed by hikers of all abilities in the summer due to its gentle gradient. 2. The Heaphy Track is the longest Great Walk and starts north of the Abel Tasman, winding from Golden Bay through forest and along coastline to the wild West Coast. 3. The next cluster of Great Walks straddles Fiordland and Mt. Aspiring National Parks in the southern reaches of the island. The Routeburn Track starts near Glenorchy, a town at the far end of Lake Wakatipu from Queenstown. It traverses dramatic valleys past alpine lakes and views of the jagged Fiordland peaks, finally hitting the Te Anau-Milford Highway, which leads into Milford Sound. 4. Also with a terminus at the highway is the Milford Track, but during the high season it can only be trekked one way, beginning at the trailhead on Lake Te Anau via water taxi. 5. The Kepler Track starts at the southern end of Lake Te Anau and is remarkable for its alpine ridges that offer stunning views of the Fiordland sounds. 6. Stewart Island is a southern annex to the South Island, and home to the Rakiura Track. It takes an hour on the ferry from Bluff to reach the island’s single town, Oban, and birdwatchers like to travel here to see kiwi and other native species. I visited New Zealand looking for a wilderness that diverged from the price tags, gentle trails, and crowds found on the Great Walks during the peak summer season. I wandered the South Island for three months. Here are my favorite lesser-known hikes, beginning with Stewart Island and working towards the Abel Tasman. Check out the websites linked for trail info. 1. 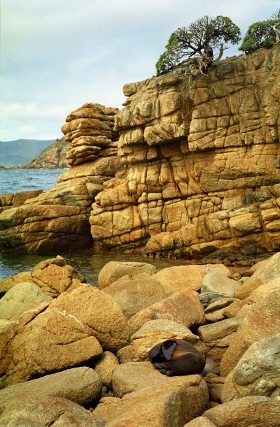 The Department of Conservation describes the Rakiura Track as an “introduction” to Stewart Island. For the real thing, start at Oban and walk two days to Mason Bay, the meeting point for hikers returning to civilization from the difficult 10-day Northern Circuit and those on the shorter but challenging Southern Circuit. This makes for great story swapping in the pristine 20-bunk hut, and there’s a 12-mile beach and rolling dunes for birdwatching. I woke up to kiwis pecking at the grass outside my bunkroom, a common experience if the logbook is to be believed. 2. 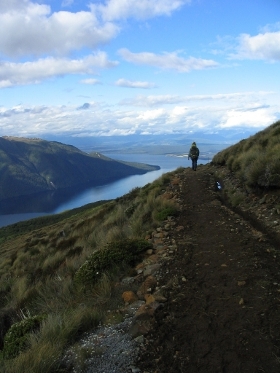 I found the best Fiordland has to offer on the Gertrude Saddle, a day hike off the Te Anau-Milford Highway. The trail rises from a gentle valley to steep sections — complete with chains bolted over bare rock — to Black Lake and bare rock slopes to reach the saddle. I had a clear day, and from the top we could see the blue of Milford Sound peeking through the angular mountains. 3. 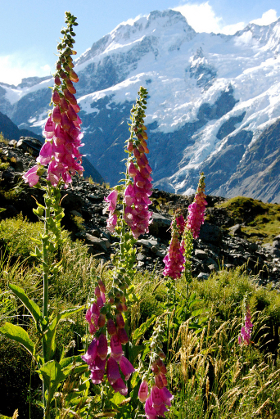 To experience scenery similar to the Routeburn but with an extra shot of adrenaline, climb the Cascade Saddle. I spent the night in Mt. Aspiring Hut, starting the steep climb to the saddle before sunrise. 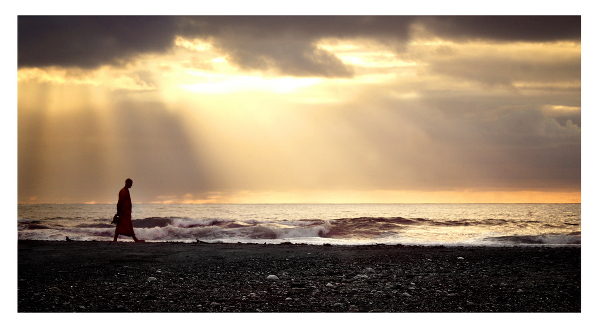 As I scrambled up one side of the Matukituki Valley, the sun’s warmth crept over the mountains at my back. Above treeline, the tussock slope feels almost vertical, and the path wanders along cliffs that plunge straight to the valley floor. The endorphins surging through me at the end of this climb made me feel as if I could fly off the 1,000-meter cliff at the top and soar across the valley to the summit of Mt. Aspiring. The descent via the edge of Dart Glacier was a unique experience, and the Dart Valley mirrors the look of the Routeburn Track. 4. 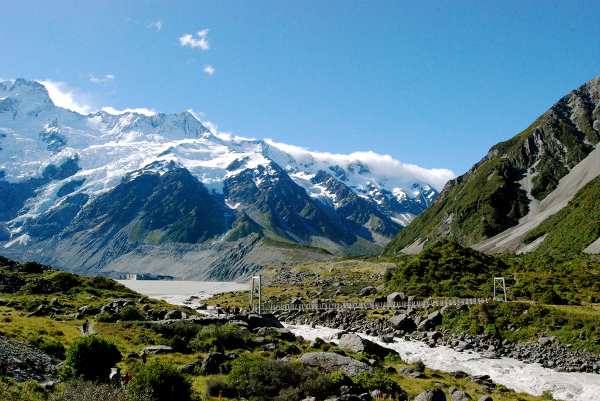 None of the Great Walks on the South Island offer a brush with Aoraki (Mt. Cook), New Zealand’s highest peak. To get a taste of the serious mountaineering that goes on in the Aoraki area, I went with Mt. Ollivier, the first mountain Sir Edmund Hillary summited. It’s a steep climb to reach Mueller Hut at 1,800 meters, and then a short jaunt over scree slopes and boulders to the summit. The reward is panoramic views of Mt. Cook and the surrounding ranges, valleys, and glaciers. On my descent, I joined the friendly volunteer wardens at Mueller Hut for a cuppa while we listened for avalanches and they shared photos of record snowfall from years past. 5. The two starting points for the Heaphy Track are in isolated locations, and it takes about five hours to drive between the trailheads. For a more flexible route with equally breathtaking landscapes, I suggest the Travers-Sabine Circuit, which is rich in side trips and alternate paths. I began along Lake Rotoiti’s edge, climbing the Cascade Track along Hukere Stream to Angelus Hut — “the purist’s way,” a man I met on the trail called it. The Mt. Cedric Route from Angelus to Sabine Hut is an alpine ridge walk that rivals the views found on the Kepler’s ridges, while the Travers Saddle is a gentler cousin to the Cascade Saddle. Along the whole circuit were the clearest rivers and most beautiful waterfalls I had seen outside Fiordland. 6. The sun, beaches, and wildlife of the Abel Tasman are so alluring that it’s difficult to bypass it altogether. For a small sampling of what sets it apart, I’d recommend a visit to the Whariwharangi Hut. The best way to reach it is by driving from the nearby town of Takaka to Totaranui Beach and picking up the Abel Tasman Track there. Totaranui is the last stop for water taxis, meaning this is where most hikers end their trip. I start here, heading north to visit the seal colony at Separation Point and winding my way to Whariwharangi. From there, the overland track back to Totaranui offers views of Wainui Inlet and Golden Bay. Planning a trip at the beginning or end of the November-March peak season will improve the odds of having trails and huts to yourself. Carrying a tent opens up more options when planning a route, and staying at campsites on Great Walks is less expensive than bedding down in the backcountry huts. Use the website of New Zealand’s Department of Conservation, which protects and manages parks and reserves in the country. DOC offers advice on how to plan a trip in the backcountry, including what gear to take and how to use its system for classifying a track’s difficulty. Take Matador’s advice on 5 Essential Rules for Low-Impact Hiking and 10 Tips for Safe and Comfortable Winter Hiking. To make time to explore all of the routes listed above, consider learning How to Work New Zealand’s Wineries.